Who enjoys the songs of the singers in the spring? Can you imagine if the parks or the forests were completely quiet? Only those who want to listen to the musicians of nature will know the effect of their songs. Birds chirp for a number of reasons. In fact, this is their way of communication, which they use to attract family members, new mates or to indicate an impending danger, almost the same as our human talking. What is the effect on our human mind and body? It appears this pleasant noise can contribute not only health but also helps us to relax and harmonize with our true self. The newest research proved, chirping can balance all biochemical processes in the human brain, because it is naturally coded to perceive it, so to relieve the stress and depression. Even more, the music of nature is one of our needs, because it promotes a better mood, attention, calmness, and creativity. Every bird's sound engages the human mind and creates a better connection with the wild, which we have lost in recent days. It is enough 10 minutes listening so to balance our mind and body. In the modern medicine, there is a new therapy for healing, mainly based on human perception of the songs of twitters, which is called ornitho- therapy. In most cases, these natural sounds are pleasant to the human ear, because they help to calm our mind and body, and boost positive feelings. What happens with the mental condition of those, who mostly listen to the city noise? It can offer only irritable and unpleasant sounds which results are illness, fatigue, insomnia, and depression. 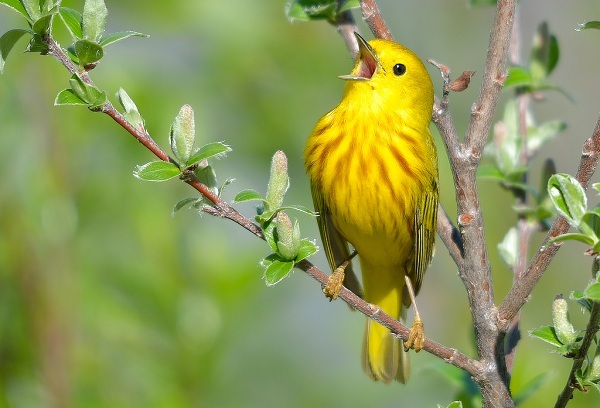 A lot of evidence suggests bird's sounds can influence human circadian rhythms, too. Especially, they are one of the external cues, that synchronize the body's internal clock to the 24-hour day. This synchronization, in turn, has positive effects on sleep and mood. It is proved people who live near places inhabited by birds, have a better and prolonged life. Being in unison with the healing sounds of nature singers, they rarely suffer from mental or physical diseases. Which kind of birds can heal our mind and body? Nature has music healers for those who will listen to them. Every bird chirps differently and most of them create melody and rhythm, thus every sound heals different parts of our body. For example, the chirping of nightingales boosts the physical activity and vitality, because it stimulates all body systems. The singing canaries sound very rhythmically and help to eliminate heart diseases and hormonal disorders. Titmouses sing nonstop and do not know they are the best music therapists that can boost the positive attitude and mood. The sparrows' tweet helps to decrease the nervosity and anxiety of hurrying people in the city. Certainly, the songs of the birds are healthful for everyone, but it is necessary to open our senses to them. Whether we go to the nearest park or prefer the bird songs recording, taking time for quick healing sounds is never wasted, our mind and body really need them.